Review Dr. King’s principles and the spiritual basis of nonviolence. Experience the power within you to creatively deal with situations of conflict. Learn and practice good communication skills. Learn skills to de-escalate violence. 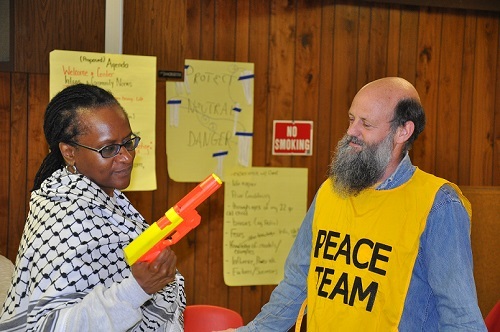 Experience role plays of Peace Teams doing violence intervention in Flint. Participants will explore nonviolence in the “big picture”; what it means, how it is used, and how good-hearted, well-intentioned individuals can disagree yet still work together. They will learn and gain practice in specific skills & tools that are useful both in conflict intervention situations and in daily life (such as Active Listening, I-messages, and the CLARA technique). They will be introduced to tools for group work (Affinity teams and consensus decision making) and to the concept of “peace teams” or third-party nonviolent intervention (TPNI) and its scope of possibilities. This special Training will have an emphasis on using skills in neighborhood situations to decrease violence and increase community safety & cohesion.